Extra information and pictures added. 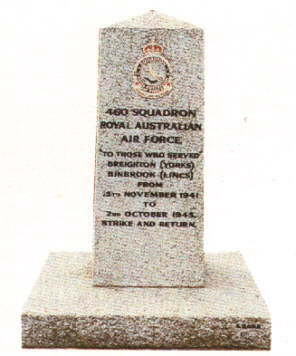 The W4960 crew was part of the RAAF 460SQN which was just transferred from Breighton to Binbrook. Over 3000 aircrew were posted to the Squadron and of these, 990 were killed in action, a great number were wounded, 193 were taken prisoner, 21 evaded capture after being shot down, and a further 10 were interned after being forced to crash-land their damaged aircraft in neutral territory. The information below has been copied from the RAAF 460sqn website. part 1: a compilation by Peter Firkins about RAAF Bomber Commands 460 sqn. part 2: a more detailed description about the period 460sqn was stationed at RAF Binbrook by Gordon Stooke. The squadrons first operation to Emden on 12 March 1942 followed four months of intensive training under the guidance of the C.O., Wing Commander A.L.G. Hubbard, DFC and the two Flight Commanders, Squadron Leaders C.L. Gilbert, DFC and A.D. Frank, DFC. Hubbard and Gilbert were both Australians who joined the R.A.F. on short service commissions before the war, whilst Frank was an R.A.F. officer attached to the squadron until succeeded by Squadron Leader J.W.E. Leighton, DFC, another Australian serving in the R.A.F. Five crews, led by Gilbert and Frank, participated in the attack on Emden which was not particularly successful because of bad weather conditions but all aircraft returned safely. This modest introduction to operations was followed by a series of attacks on U-Boat installations along the French coast, completed with only one loss. The squadron played a minor role in Bomber Command's first major attack on a city when Lubeck was raided on 28 March, 1042 and sent three crews to Rostock on 24 April, devastating the city. On 30 May 1942, Cologne became the first target for a 1000 bomber raid in which the squadron despatched 18 crews, all returning safely from this highly successful attack, creating enormous damage to the German war industry. This attack was followed by 1000 bomber raids to Essen and Bremen in June, to which the squadron contributed 19 and 20 aircraft for the loss of two crews. Pilot Officer W.L. Brill was the first member of the squadron to be decorated when he received an immediate award of the DFC for his courage in the attack on Gennevilliers on the night of 29/30 May, 1942. In the period from its first operation on 12 March, 1942 to 28 August, 1942, the squadron became fully involved in Bomber Commands campaign against the German war industry, attacking 69 targets from which 26 crews were lost, including two flight commanders, Squadron Leaders C.L. Gilbert and J.W.E. Leighton. The German anti-aircraft defences were considerably strengthened during 1941-42 with the searchlights and guns of the Kammhuber Line stretching along the whole of the enemy held coast. In support of the Kammhuber Line was a closely integrated network of ground controlled interception boxes each containing a ground controller who directed the enemy fighters onto a bomber as soon as it entered the area. A deep gun defended zone which worked in conjunction with these defences, completed the enemy network. 460 Squadron crews had become increasingly conscious of the German night fighters and numerous attacks had occurred. Pilot Officer J.A. Falkner's aircraft was attacked on the night of the 25th June, 1942 during the raid on Bremen, first by a Ju-88, which his rear gunner, Sergeant R.C. Witney shot down, followed by attacks from two Me-109's. On the 6th July, Sergeant J.C. Pearson's crew were attacked by a Me-109 whilst bombing L'Orient-Ile de Quiberon which his rear gunner, Sergeant P.C. Henderson destroyed and who, on the 17th September, in a raid on Osnabruck, claimed a Ju-88 as probably destroyed. Three nights before, in an attack on Dusseldorf, Sergeant E.K.F. Brasher's aircraft was attacked by a Ju-88 which seriously damaged his aircraft but his rear gunner Sergeant K.C. Bennett gave their attacker a long, accurate burst which caused the fighter to go into a climbing turn to port, stalled and fell away enveloped in flames. Brasher's received an immediate award of the DFM for bringing his badly damaged Wellington back to base but was killed in action two days later. Similarly, Henderson was awarded a DFM for his actions against night fighter attacks. On 22nd September, 1942, Pilot Officer D.T. Gault was shot down in an attack on Stuttgart but evaded capture, returning to England six weeks later. He was transferred to Coastal Command but was lost on his first trip with his new squadron. In September 1942, the squadron temporarily left the line to re-equip with multi-engined Halifax bombers but on the 20th October it was decided to re-arm the squadron with Lancasters. The crews were sorry to lose their faithful Wellingtons but the change from twin to four engined aircraft, symbolised the changing nature of R.A.F. Bomber Command's strategic campaign. 1943 heralded the first year in which the Allies were on the offensive and the month of March saw the commencement of the battle of the Ruhr which would do enormous damage to the heart of the German war machine, an area described by the crews laconic humour, as "Happy Valley". It was fortuitous that at this particular period when the crews were to be called upon to make enormous sacrifices, there came two officers whose appointments were almost simultaneous and whose contributions were of incalculable value to the squadron. The first was Group Captain H.I. Edwards as Station Commander, the first airman to win the VC, DSO, DFC in WW2. His courage, leadership and inspiration was largely responsible for the extraordinary operational record the squadron achieved for the remainder of the war. About the same time Wing Commander C.E. Martin DFC was appointed Squadron Commander in succession to Dilworth and was the first graduate of the Empire Training Scheme to Command a squadron in Bomber Command and he likewise set the highest standards of leadership. The Battle of the Ruhr officially opened on the night of the 5th March, 1943 when 369 aircraft bombed Essen under perfect conditions, the squadron sending ten crews without loss. In the course of the next four months until the 25th July, 1943 when this campaign concluded, the squadron crews visited the heavily industrialized cities of Essen six times, Duisburg on five occasions and Cologne four times as well as the other Ruhr targets of Dortmund, Bochum, Dusseldorf, Krefeld, Wuppertal, Oberhausen, Mulheim and Gelsenkirchen. In addition, the young crews were called upon to make other far reaching attacks on Berlin, Nuremburg, Munich, Stuttgart, Spezia, Pilsen, Turin and Hamburg. The Squadron lost three crews in the attack on the vast Skoda works at Pilsen and four nights later another three crews were lost in a heavy attack on Berlin. In addition to the aircraft lost on this raid, another six were damaged, among them Flight Sergeant H.L. Fuhrmann's whose Lancaster was badly damaged by fire from an armed ship while flying over the Baltic. Both he and his navigator, Flying Officer C.B. Anderson were seriously wounded but despite these difficulties they managed to fly their aircraft back to Britain where Fuhrmann made a crash landing and immediately collapsed from his wounds. Fuhrmann received an immediate award of the DFM and Anderson the DFC for their courage, skill and fortitude. The squadrons heavy operational commitments were not in any way disrupted by its transfer to Binbrook on the 14th May, 1943, the aircrews and ground staff flying over in Lancasters, whilst the main body were transported in Horsa gliders. The last raid of this phase of the Ruhr campaign was on Essen on 25th July, 1943 when 599 bombers, including 23 from the squadron, again inflicted heavy damage. This was the heaviest attack yet mounted on that city. Thus ended a particularly important phase of Bomber Command's campaign which created much physical disorganisation on the centres contained in the Ruhr and Rhineland. The squadron operated on 46 nights and despatched 597 Lancasters against main targets in Germany and Italy and another 20 on mine laying from which 29 crews did not return. Bomber Command now opened its spring offensive against the more scattered but equally important war industries throughout Germany. This begun with a series of three devastating raids against Hamburg on 24-27-29 July 1943, the first one of which created a firestorm of unprecedented intensity, causing enormous alarm among German authorities. A force of 740 aircraft, including 26 from the squadron participated in this attack which was followed by similar forces in the subsequent raids, the squadron losing three crews including Fuhrmann's. These were followed by heavy attacks Remcheid, Turin, Mannheim, Nuremburg and three on Milan, during which the squadron became the first in Bomber Command to complete 1000 sorties in Lancasters, a great tribute to its spirit and efficiency. On 17 August 1943, Bomber Command undertook one of its most critical operations when it successfully attacked and destroyed the German Research centre at Peenemunde. The squadron despatched 24 crews on this raid with no losses and from which Flight Sergeant D. Rees earned the CGM for beating off repeated fighter attacks and also his great skill in the previous raid on Milan when he flew through the alps on three engines and lost another over the target before making the long return flight. Wing Commander C.R. Martin completed his second tour of operations in September 1943 and was succeeded by Wing Commander R.A. Norman DFC who was shot down on the first operation of his second tour on 8 October in an attack on Hanover. He in turn was replaced by Wing Commander F.A. Arthur DFC who had completed his first tour and had the distinction of being only the second navigator in Bomber Command to lead a squadron and the first Australian. To this stage of the war, Bomber Command had devastated the Ruhr and other industrial targets throughout Germany but yet the capital, Berlin, though attacked on numerous occasions had not suffered to the same extent as other centres of Germany's war potential. The campaign to cripple Berlin commenced in earnest on 18 November when over 300 bombers attacked the capital accompanied by elaborate diversionary raids to disperse German night fighters, including a major operation by 395 aircraft on Mannheim. In the period 18 November, 1943 to 30 March, 1944, Bomber Command attacked Berlin on 16 occasions as well as 14 other major targets including Nuremburg. On the last night a total of 608 bombers were despatched, 95 being shot down, including 3 from the squadron. It was Bomber Command's most devastating period in six years of war when 1117 aircraft were lost, including 36 from the squadron, among them were the crews of three flight commanders. Squadron Leaders E.G.M. Corser DFC, L.J. Simpson DFC and E.A.G. Utz DFC. In the Berlin attack on the night of the 2 December, 1943, five squadron crews were lost, including two war correspondents. Three others came back on three engines. On the night of 16 December, four crews crashed on their return from Berlin because of the appalling weather conditions that covered the base. The squadron's magnificent reputation was enhanced even further when, for the winter months November - February, it flew 501 sorties, a record for any Bomber Squadron and on the night of 22 March, 1944, it dropped a record of 131 tons of bombs in an attack on Frankfurt. The squadron's 316 sorties on the German capital, during this period, was also the most of any in Bomber Command. Two crews also created memorable records. Warrant Officer R.A.N. Douglas DFC completed 14 of the 16 attacks on Berlin, the most for any crew doing their first tour and Flight Lieutenant A. Wales DFC, DFM, completed a similar number, the greatest for a second tour crew. And so with the Nuremburg fiasco and the end of March coinciding, the winter offensive against Germany, the prime objective of which had been Berlin, drew to a close. The liberation of Europe was now at hand and Bomber Command's campaign was largely diverted to targets associated with the impending invasion. The squadron played its part in successful attacks on marshalling the yards at Villeneuve-St Georges, Aulnoye, Aachen, Louen, Lyons and Tregnier during April-May, 1944 when losses declined. 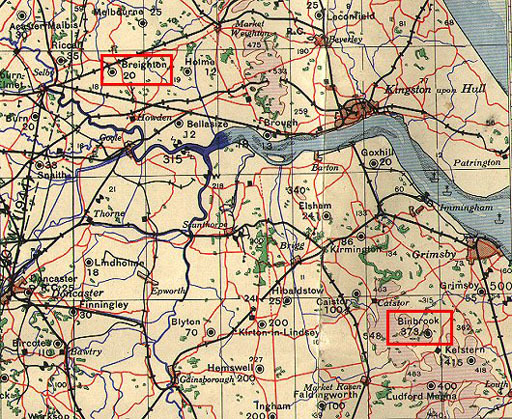 In addition to these attacks on railway centres, heavy raids were carried out on gun emplacements and ammunition dumps. Although on these operations losses were lighter, a mining operation in Danzig Bay on 4 April cost the squadron four crews from the twelve despatched, whilst three crews including another Flight Commander, Squadron Leader E.G.D. Jarman DFC were missing on Friederickshafen on 27 April and five crews were lost in the attack on the Panzer Corps camp at Mailly-le-Camp on 3 May which was sufficient cause for the crews not to become over complacent. The invasion of Europe on the 6 June, 1944 was supported by widespread raids on Foret du Core, Ardouval, Coquereaux, Bois des Jardinio and Foret de Nieppe with several heavy attacks on German positions around Caen in support of the British and Canadian armies. Another record was achieved in August, 1944 when the squadron dropped 1867 tons. Another phase of Bomber Commands strategic bombing came into force in October, 1944 when it turned its attention to German Synthetic oil plants as well as a return to industrial targets in the Ruhr. Group Captain H.I. Edwards left Binbrook as Station Commander in November, 1944 to take up a senior staff appointment on Mountbatten's SEAC staff. His passing from the squadron was a matter of great moment because of his enormous influence on its operational performance. Squadron Leader Jack Clark DFC, who had assumed command of the squadron, was shot down on 12 December in an attack on Essen and this popular officer, who had done his first tour on 460, was greatly missed. The squadron maintained its heavy operational commitments on a wide variety of German targets as 1944 drew to a close then right through to the end of the war. Another Flight Commander, Squadron Leader J.C. Holmes was lost in the attack on Chemnitz on 5 March, 1945. The squadron's Bomber Command record for the number of sorties flown in the last winter of the war, broke its its previous record and on 7 March, 1945, in the attack on Dessau, it became the first to complete 5000 sorties in Lancasters. Its last attack was on Hitler's Eagles Nest at Berchtesgaden on 25 April, 1945 when 20 aircraft took off into a clear sky for the daylight raid. Flying Officer H.C. Payne showed typical 460 fortitude when, after being seriously damaged by flack which destroyed three of his motors, he courageously stayed with the aircraft when he heard that one of his crew had snagged his parachute. He miraculously crash landed safely, so saving two lives. In May, 1945 the squadron participated in "Operation Manna" which involved dropping food on the starving Dutch people in Holland and after peace came on 8 May, 1945, it was engaged in "Exodus", the repatriation of British Commonwealth prisoners of war from Brussels. However the war against Japan still continued and the squadron was selected to join "Tiger Force", which was to be Bomber Command's contribution to the strategic bombing of Japan. Wing Commander P.H. Swan DSO, DFC, a distinguished Australian Pathfinder, was appointed to command the squadron which was transferred to East Kirkby. However the dropping of the Atomic bomb on Hiroshima and Nagasaki on 6 and 9 August, 1945, forced the surrender of Japan on 14 August. Tiger Force had no part to play and 460 Squadron flew its last flight when Wing Commander Swan took off in Lancaster RF191 to salute the Australian World War 1 Memorial at Amiens. The Lancaster "G" George, presently an exhibit in the Australian War Memorial, completed 90 operations on 460 Squadron and in October, 1944 was flown home by Flight Lieutenant E. Hudson DFC, who had completed two tours of operations on the squadron. 460 Squadron suffered higher casualties than any other unit of the Australian Army, Navy or Air Force in World War 11 and its record during three and a half years of war was phenomenal. The author, Gordon Stooke Senior passed away on Friday, April 19th, 2002. The website from where the text below was copied is now managed by his son Gordon Stooke Junior. In the summer of 1940 a Fairey Battle light bomber, piloted by Flying Officer Doug Gosman, touched down on the grass strip that served as a runway at R.A.F. Station Binbrook, opening a new chapter in aviation history. This was the first operational aircraft to land at Britian's newest airfield, opened only days after the evacuation from Dunkirk, at a time when invasion by the Germans seemed imminent. Binbrook went on to play a vital role in the final defeat of Germany, serving as a base for Fairey Battles, then Wellingtons of 12 and 142 squadrons and later the Lancasters of 460 Squadron, Royal Australian Air Force. In 1908, before anyone thought much about aeroplanes, Thomas Richard Cottingham bought his farm, 500 acres of high level ground of Lincolnshire Wolds countryside. When he died in 1917, his son Roland returned from serving with the Lincolnshire Yeomanry in Palestine and took over the reins. In 1938, the Royal Air Force approached the Cottinghams who agreed to sell their 500 acres. R.A.F. Station Binbrook was then established. The airfield was one of a string planned as part of Britain's rearmament programme. Unlike most of the war time R.A.F. establishments that sprung up in North Lincolnshire, it had brick built hangers, substantial accommodation and messes. Despite this, Binbrook lacked concrete runways and an unserviceable airfield during wet weather hampered its operational ability until this defect was corrected. One of the first aircraft to be lost from Binbrook was Fairey Battle L5568. On July 31, 1940, it was one of six sent on what proved to be an abortive raid on German shipping targets. On its way back, the Battle was attacked by British fighters near Marblethorp. The crew of three were killed. These were dangerous days for Britain, days when to shoot first and ask questions later was the unfortunate consequence of constant enemy attacks. The crew of three were interred in Binbrook's churchyard, sadly the first of many. In November, 1940, Binbrook began to convert to Vickers Wellingtons. This was a bigger, faster aircraft that carries a much heavier bomb load. Operations began seriously on April 9, 1941. Emden was the target and one Wellington from 12 Squadron, piloted by the C.O., W/C Blackden failed to return. 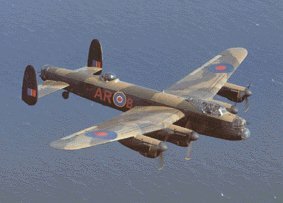 Constant involvement in operations over Europe, including raids on Berlin, continued during 1941 and on April 1, Binbrook lost its 50th aircraft when a Wellington failed to return from a raid on Le Havre. July, 1942, was an appalling month for Binbrook's crews. Seventeen aircraft were lost on raids on the Ruhr and U-boat bases in Northern Germany. By September another thirty one more had gone missing. On the 26th September, contractors moved in to start laying concrete runways so the Wellingtons moved to Wickenbyand and Grimsby. A decision had been made about the new occupants. Australians. It was towards the end of April, 1943, when the first Australian accents were heard in Binbrook's pubs. Led by G/C Hughie Edwards VC, an advance party visited the base to make preliminary arrangements for the transfer of 460 Squadron, R.A.A.F. from Breighton, near York on May 14, 1943. Grimsby and Market Rasen were places to visit but none so popular as The Marquis of Granby pub in Binbrook village. Rene Trevor ran the Marquis of Granby throughout the war. She was the licensee but found herself thrust into the role of "mother" to hundreds of young Australian airmen. She sewed on buttons and new decorations, mended jackets and cooked meals for the young men who flew the bombers from Binbrook between 1940 and 1945. The youngsters who flew those aircraft never forgot Rene Trevor. She had been brought up in Tealby where her father ran the Crown Inn for 43 years and it seemed natural for Rene and her husband to go into the licensed trade themselves. This they did in November 1939, just after their daughter, Anne, was born. Her husband was posted to the Middle East and Rene was left to run the pub. The first airmen to arrive at the Marquis of Granby were the crews of the obsolete Fairey Battles. Rene can remember them saying, "A real English Pub with a piano -- can you play it?" Rene could and she could sing too. That started a relationship between the Granby, its landlady and the boys of Bomber Command. Songs such as 'Cowboy Joe' and 'Good night Sweet- heart' were to become familiar at the pub throughout the war years. Aircrew would walk or cycle down to the Marquis every night they could for a pint or two of Holes Ale (later Hewitts, Guinness or whatever else she could obtain) or maybe she would serve her famous meal -- sausage, two eggs and toast, for 1s.6d. She still remembers the day the Australians moved in. "My daughter Anne was about three at the time and we had just begun to tell her about the war and about the Germans. One day she came running in screaming, "Mummy, Mummy, the Germans are here!" She had just heard an Australian accent for the first time. Despite the fearful odds -- 460 Squadron lost more aircrew than any other in Bomber Command -- many did complete their 30 trip tour of operations and on each occasion there was another party in the back room of the Granby. One of the traditions at these parties was for the airmen who had successfully finished their tour, to br held aloft while they wrote their names on the ceiling of the room. Perhaps those names are still there now under several coats of paint. Mrs. Rene Trevor now lives in a flat on Cleethorpes sea front. Over her fireplace hangs 460 Squadrons Kangaroo and Boomerang crest baring the motto " Strike and Return". "Oh, they were marvellous days. They were wonderful boys and I knew just about every one of them."